On December 10, 1938, David O. Selznick burned down Atlanta. On the back of his Culver City studio, Selznick had begun filming what would be his and Hollywood’s greatest triumph, GONE WITH THE WIND. Selznick was just thirty-six years old and already a legend. He had run a major studio before the age of thirty and created his own studio by the time he was thirty-three. With a harsh and controlling demeanor, he dominated every film he made. In a town of Mayers, Zanucks, and Goldwyns, David Selznick was king. But one of his most lasting contributions would have nothing to do with his grand, southern epic. Instead, it would be bringing to America a rotund, quiet director who was the shining star of British cinema. In the summer of 1939, David Selznick brought Alfred Hitchcock to Hollywood. David Oliver Selznick was born into a wealthy Pennsylvania family in 1902. His father Lewis J. Selznick was a successful film producer, and David studied the industry from his early years. As a young man he worked for his father, moving to Hollywood and MGM in 1926. With a voracious appetite for success he worked his way from the bottom of Hollywood to the top—moving from MGM, where he was a story editor and associate producer, to Paramount as an associate director, to RKO as vice president of production, and back to MGM. Returning to MGM he played a crucial part of the production of a number of major films including George Cukor’s DAVID COPPERFIELD and DINNER AT EIGHT. Selznick longed for his independence and in 1936 formed Selznick International. Within three years he had secured his place among the elite of Hollywood with the production of one of its greatest films, GONE WITH THE WIND. While finishing the film, Selznick hired an English director who was looking to make a go of it in Hollywood. Alfred Hitchcock was born in 1899 to a middle-class London family. In 1914 he found a job with the Famous Players—Lasky Corporation as a title card designer, beginning his long career in the film industry. Within a few years he had moved up in the company to directing films. Working with the Lasky Corporation in Berlin, Hitchcock made his first two pictures. A few years later Hitchcock made the film he would note as the beginning of his career. THE LODGER (1926), a retelling of the story of Jack the Ripper, began a string of suspense films that would bring him to the top of the English cinema. Among the other well-known films of his English period were BLACKMAIL (1929), THE MAN WHO KNEW TOO MUCH (1934), and THE THIRTY-NINE STEPS (1935). The English cinema had little money, and Hitchcock longed to be in Hollywood, where the world’s best films were being made. For Hitchcock, being a director meant being the primary creative source for the film—working on everything from the script to the props. In Hollywood, however, the power of the studios put producers in charge. For the Hollywood of the 1930s, screenwriters and directors were interchangeable technicians, not given serious consideration in the artistic decisions of the film. More than any other producer, Selznick took advantage of this and controlled nearly every aspect of his movies. Not surprisingly, Hitchcock and Selznick had difficulties from the very first film they made, REBECCA (1940). Disagreements began with Hitchcock’s adaptation of Daphne du Maurier’s novel and lasted through the film’s completion. For the final scene, Selznick wanted smoke to form the shape of an “R” in the sky. Hitchcock was appalled. He suggested a subtler metaphor: the memory of Rebecca should go up in flames with an “R” embroidered on a bed pillow. Hitchcock won, but he felt battered by Selznick and resented his producer’s complete command of post-production. The two didn’t work together again until 1945, with their hit SPELLBOUND. Though Hitchcock had more experience and notoriety in Hollywood by this time, his relationship with Selznick remained a struggle. Both men had different ways of making movies, and both believed they deserved control of the picture. In the end, Selznick won, but it would be the last time. Earning both men Oscars, SPELLBOUND marked a change in Hitchcock’s career and in the future of Hollywood. Nearing the end of his contract with Selznick, Hitchcock had become a major force in the movie industry. 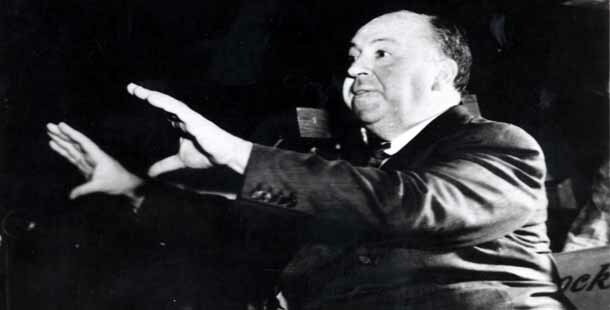 Hitchcock’s notoriety and his ability to independently create successful films of substance signaled, for many, the rise of the director and the decline of the producer. Though the studios and producers would remain, after Hitchcock it would be the director whose artistic vision mattered. With Hitchcock’s career just beginning and Selznick’s on the decline, the final year of their collaboration would mark turning points in both men’s lives. In 1946 Selznick was deeply enmeshed in his epic film DUEL IN THE SUN and Hitchcock was working independently on NOTORIOUS. When both films were released, each man’s future seemed clear. NOTORIOUS was a masterpiece, and one in which Hitchcock had finally been given full control, and DUEL IN THE SUN was a flop, nearly bankrupting Selznick. Contractually obliged to finish one more film with Selznick, an uninspired Hitchcock worked on THE PARADINE CASE (1948), after which both men went their separate ways. For Selznick there was to be only a few more films. By the time of his death in 1965, Alfred Hitchcock had made dozens of movies including ROPE (1948), DIAL M FOR MURDER (1954) VERTIGO (1957), PSYCHO (1960), and THE BIRDS (1963), becoming one of the greatest filmmakers of all time. After their collaboration, the movie industry would never be the same—not for Selznick, not for Hitchcock, not for anyone.